Update: Learn about the deployment process as code pattern where we will continue to provide the best approaches for storing your Octopus configuration in code. We are actively investing in an official Octopus Terraform Provider for declarative configuration of Octopus. The #6 highest voted item in our UserVoice is some way to store Octopus data in source control. It's something we think about a lot, and I've lost count of how many times we've drawn solutions for it on the whiteboard over the years. I think we've come up with an alternative approach to this problem that's much simpler, and could satisfy the majority of use-cases, and that could be more flexible and powerful than the default assumption of "sync Octopus settings to version control". I'm calling it "Octopus Declarative" for now, and in this post I want to make the case why it's a superior approach, and get your feedback on whether it's the right direction. Suppose we took the approach of synchronizing settings in Octopus with a Git repository. For it to be truly useful, it would need to work bi-directionally (so people can make changes in Git and have them appear in Octopus). The first issue is the synchronization process and dealing with conflict. Each time you change something in Octopus, we'd need to commit the change to Git, and push it to any remotes (e.g., GitHub, VSTS) that you've configured. It's quite possible that there might be a conflicting change on one of those remotes, so Octopus would need some form of conflict resolution. What would happen if you change a deployment process, then create a release, then deploy it, and somewhere during that process we detected a conflict? We could roll back, but we already made a deployment based on that change. The second issue is scope. Do we have one Git repo for an entire Octopus server? Or do we have one for each individual project? Given Octopus is used for production deployments, and Git doesn't have a lot of controls around who can edit files in a given path, I think an Octopus server-wide Git repo would be out of the question. But if we're going to have a repo per project (and another for the library), what happens when we need to make a change across multiple of them? And what happens if one of the repos has a conflict but the others don't? As I think through these problems, I realize that there are solutions to all of these. But my spidey senses tell me there's quite a bit of effort involved to make it production ready. I could easily imagine us spending 4-6 months getting something like this to work. As I thought about version control and DevOps tooling in general, it dawned on me that there are other ways this problem can be solved. For example, take Amazon Web Services. AWS is the go-to example of Infrastructure as Code. Heck, the reason the AWS team don't put any effort into the AWS Console user interface is because they assume everyone is using the command line or REST API's to manage their AWS infrastructure (OK, I made that up). No one would claim "we shoudn't use AWS because it's not version controlled". Yet, there's no page in AWS that I could find that tells it to sync your AWS account to Git. Instead, AWS exposes API's, and you write code against them - and of course you can version control that code. The scoping issues go away. It up to you to decide which repository should contain the code that sets up each part of your AWS account. Since you are executing code against an API, not just pushing JSON files into Git, you can use for loops, query external services, etc. Granted, certain AWS services like CloudFormation do use declarative JSON approaches to configure them, but again, you don't commit them to a repository and expect AWS to sync it bi-directionally - you version control it yourself, then call their API to upload a new configuration. Octopus already has a comprehensive REST API that you can use to do anything that you can do in the Octopus UI. 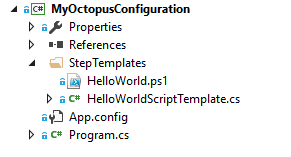 And we have a .NET client library, Octopus.Client, that you can use work with the API easily from C#. Each time you change the .PS1 files or the step template parameters, you could just re-run this app you've built to push the new configuration into Octopus. You could even set up a TFS or TeamCity build to compile, test and run it every time you change the scripts. The same can be done for deployment processes or variable sets (with the exception of sensitive variables - we'll find a solution for that). While you can do it, right now it's not quite something I'd recommend to everyone. First, the code to check if each resource exists, if not create it, if so update it, etc.. would get very tedious. The Program.cs file would call some method in Octopus.Client to apply the configuration by making calls to our REST API, checking if resources exsit, creating them if they don't, and ensuring they match what they are expected to be. We'd build a bunch of nice ways to define other resource types too. There would be a nice C# object model for building out a deployment process, or a variable set. Or perhaps to import the variables from a CSV or XLSX file. In your Program.cs, you could loop over your customer database and new up this template for each customer, then push the configuration to Octopus. This is similar to the approach taken by the Kotlin DSL for TeamCity, except that you get a lot more choice around how and when you run it. To make this feature truly shine and get people using it, I think we'd need a few extra features. In addition to applying the declarative configuration, you could detect whether anything has changed in the Octopus server that means it has "drifted" from the configuration. You could run that on a schedule, for example, to detect if someone modified something they shouldn't have. If you are looping over an external data set and using it to dynamically create Octopus projects, users are going to get annoyed if they make changes to those projects, and you obliterate them the next time the project runs. I imagine we'll provide a simple mechanism that lets you "lock" certain resource types from being edited in the UI, with a nice message. It's not always easy to map our UI to the resources underneath, so we'd need some way to take an object and export it to the equivalent declarative C# code. This could also be part of Octopus.Client, or something we build into the Octopus UI to make it discoverable. Composite step templates - 609 votes Quite often people just want multiple projects to reuse deployment steps. It would be possible to just reuse the same object in C# code across projects. The only question is whether for these projects, they'd be OK with not being editable in the UI anymore. Improve the variables UI - 834 votes Most of the comments here were focused on dealing with many variables, which are probably defined elsewhere. While we should still do work to improve the UI (we will! ), being able to programatically create them or import from a spreadsheet would help many people. Inheritable templates - 171 votes My example above already showed how this could work. In fact, the "template" project could remain editable within Octopus, and the code would pull it down, and clone it for each instance of it. As a product owner, I'm not afraid of "stop the world rewrites" that take 6-9 months or more. We did it in Octopus 1.6 to 2.0, when we rewrote our orchestration layer and went API-first. We did it again in 3.0 when we switched from RavenDB to SQL Server. When I'm confident the end result is going to be a much better product, I'm happy to go down that path. If we took the approach of storing Octopus configuration as XML or JSON files in a Git repository, I think it would take significant effort to address the challenges I mentioned before. And ultimately, if you wanted to take the "for loop" approach to dynamically generate your configuration based on external data sources, you'd want to disable UI editing and use a nice, strongly typed language to do it. And I think we can build that for much less effort. We're at a point in the year where we need to make a decision one way or the other. If we go the Git sync approach, the user experience is likely to impact most of the new features we're building, so we'll probably start working on that first. On the other hand, if we take the declarative Octopus Client approach I've outlined here, it's something we can easily ship and improve over the next few months without slowing anything else down. My question to you is: does this declarative C# approach work for you? Or is there something else you would need from version controlled Octopus configuration?